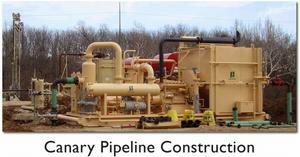 STILWELL, KS -- (MARKET WIRE) -- May 7, 2007 -- Canary Resources Inc. (PINKSHEETS: CYRR) ("Canary") today announced that it has completed construction of its wholly owned tap into the Southern Star Central Gas Pipeline. Canary is currently testing the interconnect facilities. Canary is developing coal-bed methane gas in the Eastern Forest City Basin of Kansas and Missouri. Twelve of Canary's completed gas wells, presently shut-in pending pipeline connection, are in the immediate vicinity of its Southern Star interconnect. Initial indications from the wells near the tap are positive: all have good gas shows and are expected to be productive wells. Hook-up of the wells is underway, and Canary expects to achieve commercial gas production and start realizing transportation fees in the second quarter of 2007. Canary Resources Inc. is independent Oil and Natural Gas Company engaged in the acquisition, exploitation, production and development of oil and natural gas properties in Johnson and Miami Counties, Kansas, and in Bates and Cass Counties, Missouri, for which it is the operator. Canary has offices in Houston, Texas, and Stilwell, Kansas. Portions of this document include "forward-looking statements," which may be understood as any statement other than a statement of historical fact. Forward-looking statements contained in this document are made pursuant to the safe harbor provisions of the Private Securities Litigation Reform Act of 1995. These statements are based on management's current expectations and are subject to uncertainty and changes in circumstances. We have tried, whenever possible, to identify these forward-looking statements using words such as "anticipates," "believes," "estimates," "expects," "intends," "plans," "potential" and similar expressions. Actual results may vary materially from management's expectations and projections expressed in this document. Certain factors that can affect the Company's ability to achieve projected results include, among others, production variances from expectations, uncertainties about estimates of reserves, volatility of oil and gas prices, the need to develop and replace reserves, the substantial capital expenditures required to fund operations, environmental risks, drilling and operating risks, risks related to exploratory and development drilling, competition, government regulation and the ability of the Company to implement its business strategy. Copyright 2007. All rights reserved Canary Resources Inc.
About this company Canary Resources Inc.